Mercy. I have my own understanding of mercy but I just googled it anyway to see how it is officially defined for anyone that is curious. 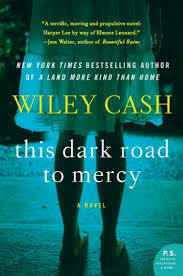 Google says, “Mercy is a broad term that refers to benevolence , forgiveness and kindness in a variety of ethical, religious, social and legal contexts.” Being intrigued by the title, This Dark Road to Mercy, I wanted to turn the word over in my mind and consider the role that mercy played in the story. Here’s a basic summary: Wade is a washed-up, ex-minor league baseball player. He’s the kind of person that trouble seems to follow. Sometimes it’s his doing, sometimes not. (I know someone like that.) He shows up a few weeks after the death of his ex to see about taking custody of his two young daughters, Easter and Ruby, who are living in a foster home. While Wade has his own reasons/consequences for being on the run, he is still longing for the connections of his own flesh and blood and he adds another reason to be chased down when he kidnaps his girls in the middle of the night. Mercy. Pretty much everyone in this story needed it. (Don’t we all?) Wade needed the mercy of bounty hunters, society, the foster home/system and most importantly his girls. Easter needed the mercy of loving authority and even the added mercy of a young boy she was fumbling through her first romance with. Brady Weller, the girls’ guardian ad litem, needed the mercy of his own daughter and the police force he used to work for. The bounty hunter, vicious and murderous, grew up without the loving mercy of his abusive father, and that created a void in his life that was never filled. And then there was mercy for me. Yes, me! I knew when I bought this book that Wiley Cash is considered to be a “Southern Gothic” writer. I understand a little bit about the genre and that Flannery O’Connor is famous for it. Alas…Flannery is not my favorite. I reviewed Everything that Rises Must Converge while I was working on my LOST book club challenge. (If you’d like to see my thoughts on her writing, I had a lot of fun with it and even had somewhat of an epiphany.) So, I knew that I could expect some unpleasantries or some darkness in this novel. And hear me, I’m not opposed to reading darkly themed books. I enjoy some of them. What I didn’t enjoy about O’Connor was that the stories seemed too abrupt. Gore for the sake of gore. I’m sure that’s my ignorance because people esteem her work highly. (Maybe I should take a class.) Anyway, I felt I was given some mercy in this book because it didn’t end like I thought it would. I was quite happy with how it all wrapped up considering that a dad on the run after kidnapping his daughters can never end happily. But thank you, Mr. Cash, for sparing me another O’Connor moment. I can’t say that about your first book, A Land More Kind than Home. Though I really liked that one too. I grew up in Charlotte, NC, just a stone’s throw away from Gastonia where most of this story takes place. When the narrator mentioned streets and landmarks like Wilkinson Blvd. and Camp Thunderbird, I felt like I was there, just because I knew where he was in the story. While on the run, Wade takes his girls to Myrtle Beach, SC. They walk the boardwalk and play games in the arcade and he mentions the Magic Attic, which is no longer there, but was a huge teen concert attraction in all the years I vacationed there with family and friends. In fact, I almost met my future husband there when I was a young teenager. I know a lot of times people read a book for escape and to learn about other places and times, but I have to say it is just as enjoyable to read about and revisit the places you have lived and walked in reality. For that reason, and others, I’ll probably read everything Wiley Cash writes. I havent read Wiley Cash yet but he’s on my radar. It’s cool to read novels from one’s neck of the woods.